Money paid out though the for energy and water saving projects comes back in the form of utility savings. UVic has been funding stakeholder driven energy and water saving projects since 2011 through the Revolving Sustainability Loan Fund initiative. The Revolving Sustainability Loan Fund (RSLF) provides $250,000 to fund conservation projects on campus that provide a return on investment. The loans are paid back with the savings from utility or operating costs. Through loan repayments, the fund is able to reinvest the capital to fund additional sustainability projects on campus. Learn more about how the fund works below. 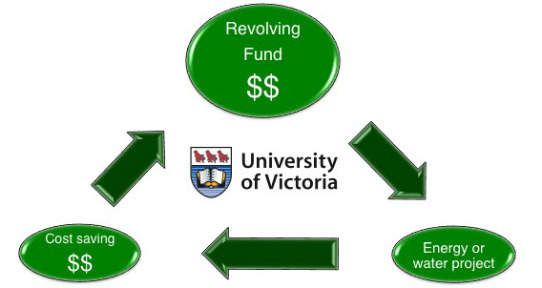 As of 2016, applications for the Revolving Fund are made through the Campus Sustainability Fund.